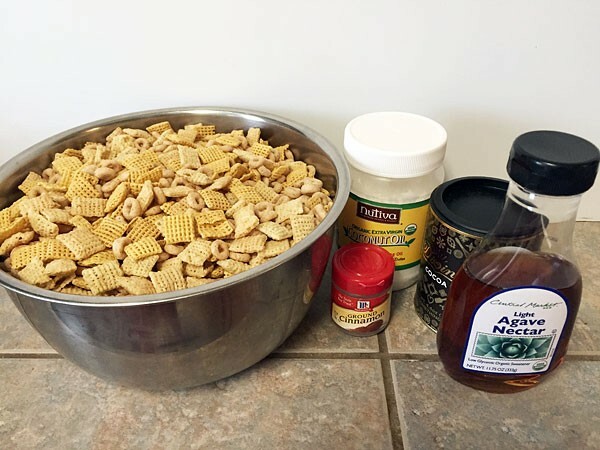 You can make homemade chex mix without the extra calories! People think by eating significantly less you will lose weight. False. You just have to eat right! I’m ALWAYS snacking. I come up with weekly snack options to ensure I’m making good choices and not spending too much on over-priced munchies. This snack is another homemade chex mix made with coconut oil rather than butter. You can view another version I did here! Instead of the puppy chow variation this is more a type of trail mix. The addition of cinnamon and cocoa powder gave it quite an addicting flavor! Plus, there is no added sugar used in the recipe! First set out the ingredients to mix together. I chose chex (I had both wheat and corn) and cheerios to put in the bowl. I added the nuts and dried fruit later but you can include them at the beginning if you prefer. For those I had dried pineapple chunks, pistachios and almonds. You will need coconut oil, agave nectar, cocoa powder and cinnamon for the glaze. The cocoa powder I use is Divine brand. Hands down this is my favorite cocoa powder! It’s so rich and wonderful to use in baking and for hot chocolate. Next, combine the coconut oil and agave nectar in a small bowl and heat until melted. Stir in the cinnamon and cocoa powder. Pour this glaze over the contents of the bowl and stir until fully coated. Put the mix in a ziploc bag and place in the freezer for 30 minutes to harden. Remove and add in the remaining ingredients if you have not already done so. Serve, or store in the fridge for later! Cocoa Cinnamon Chex Mix with dried fruit and nuts in a sweet coconut oil glaze. 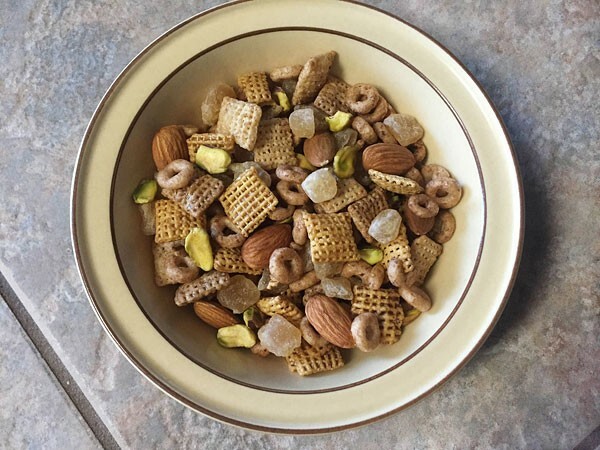 Mix the ingredients in the bowl- chex, cheerios, dried pineapple chunks, pistachios and almonds. For the glaze combine the coconut oil and agave nectar and heat until melted. Stir in the cinnamon and cocoa powder. Pour over the contents of the bowl and stir. Put the mix in a ziploc bag and place in the freezer for 30 minutes to harden. Remove and serve, or store in the fridge! Great for parties or for use as daily snacks! I stored mine in the fridge to snack on and it lasted for about two weeks! 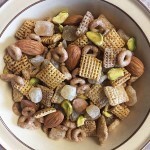 If you have a potluck or party this healthy homemade chex mix is a perfect contribution to the table. The pineapple and coconut oil together bring a subtle tropical flavor to the mix too, which makes it stand out! Something that goes great with this cinnamon snack is my favorite sweet and spicy tea! I order it in bulk because I drink about two bags a day and just can’t seem to get enough of it. Everyone I introduce it to raves about it and becomes hooked. To top it off there are no artificial sweeteners added. Thank you, Lydia! It will definitely be one that I make again! I neeeeed to try this! You have reinvented “healthy holiday snacks” right here! 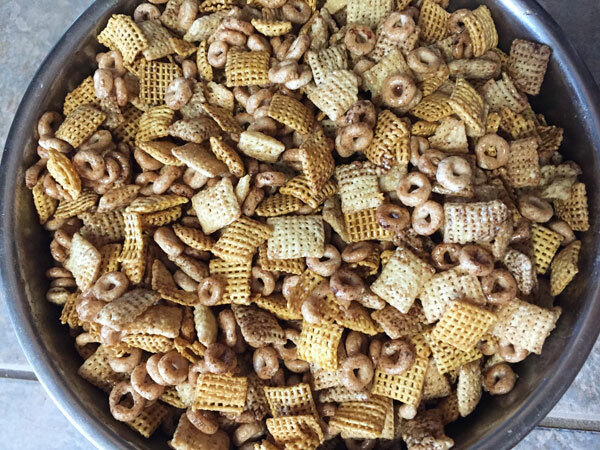 Chex mix is one of my favorites, I can’t wait to indulge in a healthier version. 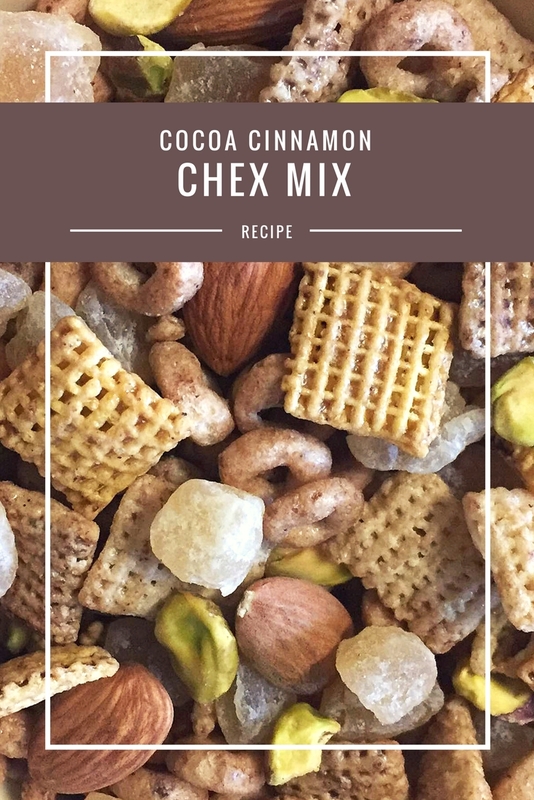 Chex mix is so tasty…love the fact that you came up with a healthy version! My love of chex mix and snacking inspired me to make a guilt free version haha! Looks and sounds totally yummy! Oh this looks perfect for a movie night snack! I love cinnamon anything. Will definitely try soon :-).